You do not apply colors on yourself, but others do. And when others apply colors on you, they do not look directions, alignment, ears, eyes, and nose as precisely you may want them too. +Kyunki Bura na maano Holi hai. So better safe than sorry, prepare than worry. 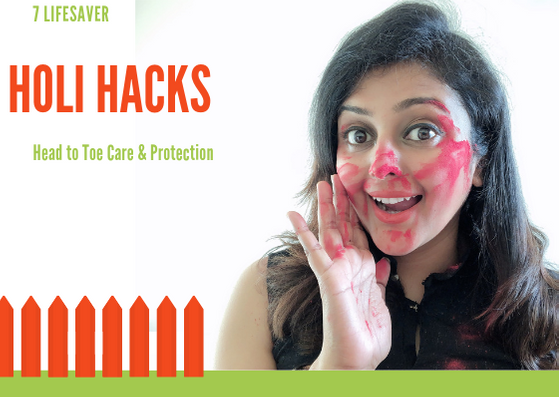 I am going to give you a few tips from head to toe as to how you can protect damage control and have a Holi a less messy affair. Hack no 1: Hair. Wear a fancy cap but hats and caps are not waterproof. So it always good to oil your hair in moderation. Oiling is good. use one at room temperature and its better if you oil a night before playing colors. alternatively, you can squeeze some aloe vera juice and apply on your hair. worried about pics? try funky bandana. Once you had your bath, do apply oil all over your body. If anyone suggests that it's a champu idea, show them their last year oily face. Do not worry and keep applying that oil. The most preferred oil is mustard. It will not just add a layer on your skin but would also keep your skin warm. if u really can't stand mustard oil in spite of its unparalleled qualities, go for coconut oil or olive oil or sesame oil. You can use castor oil but mix it with some other oil. use a nice wireless earplug like the ones they give in F1 rally or simply insert some cotton. our eardrums have no business playing Holi and they should be kept protected and clear to hear the beautiful songs. This is one makeup you should be allowed to wear on Holi. Apply your favorite color on the nails or even better, play with colors and make a style statement. For the backside of nails, it's good if you can trim your nails as you may risk hurting someone with long nails in Holi hoordang. and if you don't want to cut them too short, apply Vaseline. Hack no 7: drink a lot of water to keep hydrated. hack no 8: Lips use a good lip balm or just ghee. this is before you play Holi, after you have played Holi [to remove the colors] and after your bath too. And the biggest hack is- Color yourself first. Yup Holi pe clean face is like khuli tijori . Hence this fun hack wherein you take some natural color like Haldi [Turmeric] mixed besan or herbal gulal and apply on your face before you venture out. You had a good time in the sun but now the tough time starts wherein you need to remove the colors. So do not make it even tougher and go for these simple hacks. Because you need to quickly get back for the feast na? Go for bare essential tips for the day and keep all your spa and scrubbing and deep conditioning with masks for another day. here are a few handy tips you must follow. 1) Bucket: Use a bucket for your bath. Showers often stress up your hair and after all those colors, you need a good rinse and not need further stress. Also, do not wash your face, body or hair more than 2 times. Let the colors go slowly. Flaunt your Holi look. 2) Clean cloth: Post playing Holi, do dust your face and body before entering your house with a clean cloth. this will remove residual colors. 3) Dahi Besan: Its there in all the kitchens and is helpful. Once you are done soaping, apply it all over your face and body and clean. You can also try a natural Lemon Honey cleanser to remove the etc color. Avoid scrubbing your face with any cosmetic scrub. You can use scrub a day after you played the Holi. 5) Tree: You enjoyed the festival? You had ample water to clean up? NOw be a good soul and plant a sustainable tree. you can do this a day after Holi.